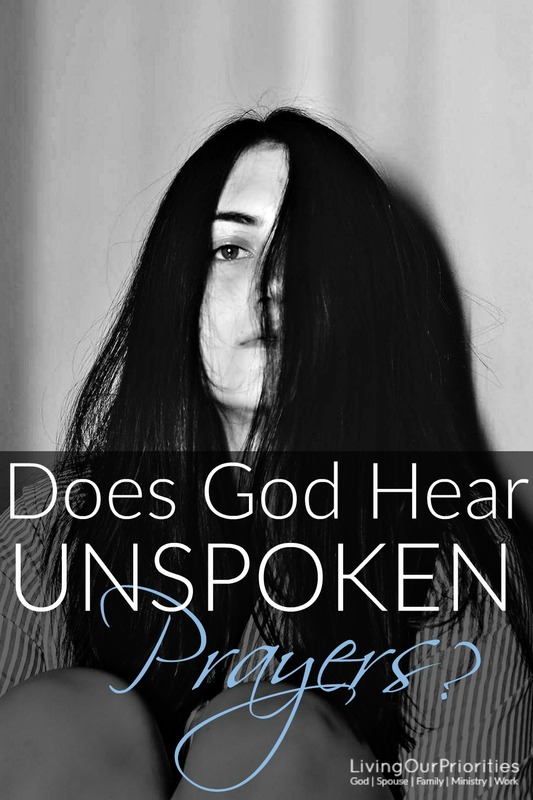 Does God Hear Unspoken Prayers? Have you said a prayer to yourself hoping that God would hear you? You know, the kind of prayer you never utter out loud, but secretly hoped God would hear? Over six years ago, when we were coming out of our financial struggle, it was about the time for school to start, and the kids needed clothes. We had made great progress recovering financially, but extras like school clothes, was still a challenge. We never spoke of what we needed, but as the weeks and days got closer to school starting, it became a concern because the kids started asking us when were we going to go school shopping. As a mother, I remember nights when I went to sleep with tears rolling down my face on the pillow and praying silently that God would supernaturally provide. As I grew tired of making excuses for why we were waiting. One day, I was preparing for our women’s ministry and had spoken with my beloved pastor and my mentor, Lorri. As we were going over the details of the ministry, she asked me how we were doing with getting the kids ready for school. While I contemplated how I would answer, before I could think about it, I immediately responded and said, we’re not ready right now, but we will be. Over the years, we learned when to ask for help (by letting others know there was a need), and when we needed to just be silent, and wait on God. However, this was one of those moments where I felt led to be quiet. I truly believed that God knew my heart, and knew my silent prayer. So I decided to be quiet and trust Him. The next day, I went to our women’s fellowship group and Lorri handed me an envelope. She told me to put it in my purse, and to open it when I got home. Upon getting home, I opened the card. To my surprise, inside the card was five $100 bills. Sometimes we endure such heartache, pain, or distress that it becomes impossible to formulate words, let alone a prayer to God. However, what the card did for me was not only prove that God is our provider, but that God saw my pain, saw my hurt, and more importantly, heard my heart when I was unable to speak. Coming to a place of complete reliance on God, isn’t always shown by: how often we pray; how often we read; or how often we go to church. Complete reliance comes when nobody is around, and it’s just you and God. And that’s where God meets us and offers help that only He can give. No matter the challenge or situation you find yourself in today; I’d encourage you to pray about it, more than you talk about it. Even if that means all you do is sit in His presence without uttering a word. Allow God to hear your heart. After all, He knows our deepest thoughts! This post is being shared on Grace and Truth A Weekly Christian Link Up and Salt & Light Link Up! A wonderful post that helps to solidify how great God is! Thanks for for sharing! This post blessed me so much. I stumbled across your site from Pinterest and I am so glad I did. I am one of the silent praying ones. I write a lot of my prayers out, but found this spoke volumes to me and reassured me of knowing the Lord hears me, even when no words are uttered. Blessings! Timberley, I answered the question your post title asked and said Yes, He does answer unspoken prayers. And wow! What a testimony you have to share with others! So very powerful. The quote from Max Lucado nailed it, didn’t it? Wow. I also appreciate your statement: “Complete reliance comes when nobody is around, and it’s just you and God. And that’s where God meets us and offers help that only He can give.” This is so very true. It’s what we do when no one is watching that shows the depth of our faith and reliance on Him. Thank you for sharing this powerful testimony. Stopped by from By His Grace. I LOVE reading stories about answered prayers. I love even more hearing stories about God sending specific messages so you know it was Him that came through for you. Everything about this is truly beautiful. This was SO amazing and encouraging! It brought tears to my eyes. There is truly nothing better than hearing others stories of God’s faithfulness and answered prayer- especially unspoken ones. Thank you so much for sharing! !